The Orchid Club is hosting a Wellness Workshop on Sunday, March 11, from 3:00-4:30 pm at the Bozeman Public Library. It’s open to the public, so please share the news! 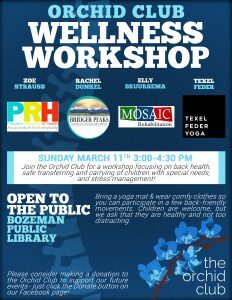 We will have great speakers discussing back health (transferring, carrying, and caring for children with special needs specifically), yoga poses to reduce back pain, how acupuncture can help, and ways to manage stress. We’ve got the whole neurological system covered! We encourage you to bring a yoga mat and dress comfortably to participate in some of the exercises recommended by our experts. As always, children are welcome (as long as they’re healthy and don’t distract too much).